MalwareFox AntiMalware version 2.74.0.150 suffers from a local privilege escalation vulnerability. Ubuntu Security Notice 3559-1 - It was discovered that Django incorrectly handled certain requests. An attacker could possibly use this to access sensitive information. Debian Linux Security Advisory 4105-1 - It was discovered that mpv, a media player, was vulnerable to remote code execution attacks. An attacker could craft a malicious web page that, when used as an argument in mpv, could execute arbitrary code in the host of the mpv user. Slackware Security Advisory - New kernel packages are available for Slackware 14.2 to mitigate the speculative side channel attack known as Spectre variant 2. Kaspersky Secure Mail Gateway version 1.1.0.379 suffers from code execution and cross site request forgery vulnerabilities. Ubuntu Security Notice 3558-1 - Karim Hossen and Thomas Imbert and Nelson William Gamazo Sanchez independently discovered that systemd-resolved incorrectly handled certain DNS responses. A remote attacker could possibly use this issue to cause systemd to temporarily stop responding, resulting in a denial of service. This issue only affected Ubuntu 16.04 LTS. It was discovered that systemd incorrectly handled automounted volumes. A local attacker could possibly use this issue to cause applications to hang, resulting in a denial of service. Various other issues were also addressed. Ubuntu Security Notice 3550-2 - USN-3550-1 fixed several vulnerabilities in ClamAV. This update provides the corresponding update for Ubuntu 12.04 ESM. It was discovered that ClamAV incorrectly handled parsing certain mail messages. A remote attacker could use this issue to cause ClamAV to crash, resulting in a denial of service, or possibly execute arbitrary code. Various other issues were also addressed. Exactly how many people are using these banknotes for "fake fingerprints" with their phone? that only your fingerprint can unlock your phone for example. This whole advisory seems like one big troll. From these two lists that are provided as input to altdns, the tool then generates a massive output of “altered” or “mutated” potential subdomains that could be present. 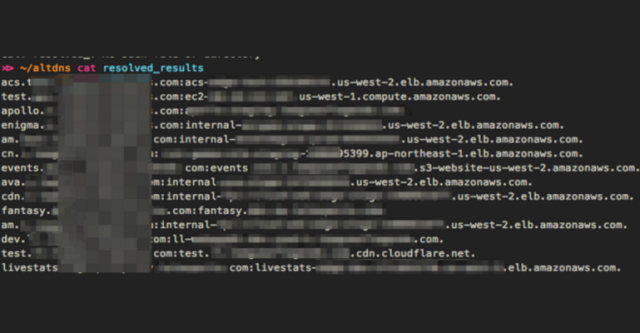 Read the rest of altdns – Subdomain Recon Tool With Permutation Generation now! Only available at Darknet.